The remarkable Russian artist Mikhail Vasilyevich Nesterov in his paintings embodied his ideas about the homeland. He himself tenderly and tenderly treated Russia, its traditions and customs, which are still preserved in the village. The peasant theme, the strong and unshakable spirit of the Russian simple people can be more and more often seen in his work. 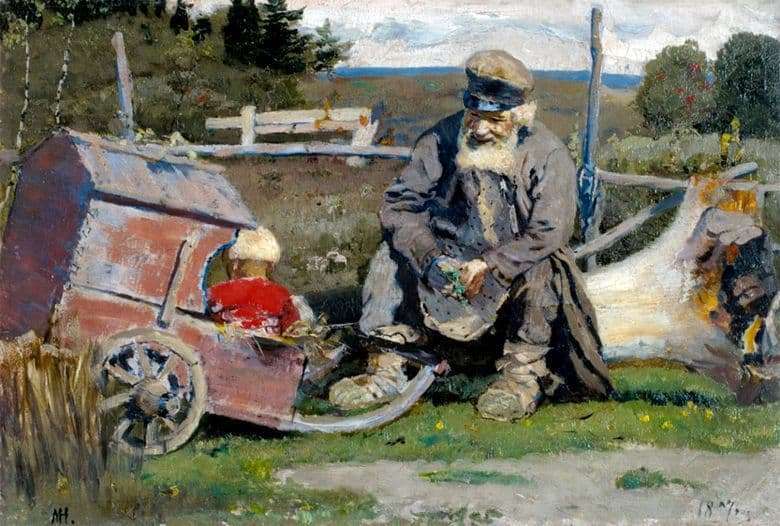 The ordinary day of the Russian peasant attracted the attention of the artist, and this can be seen in the painting “Old and Small.” Looking at this work, a feeling of simplicity and fusion with nature, so beautiful and pure, is created. In the picture “Old and Little” you can see the main characters of the paintings, the old man and his grandson, who sits in a small, ruined trolley and plays, while the grandfather looks at his grandson proudly and affectionately. The painting has an atmosphere of rustic warmth that blends harmoniously with nature – the sky, greenery. The work was created with warm shades of colors that emphasize every detail of the picture. However, on this juicy and beautiful background, the boy stands out as well as the grandfather. If you look at each character in detail, you can see the old man’s exhausted face, his callused hands, which are reminiscent of the consequences of hard work. Despite the fact that the peasants are working and suffering, plowing the ground and growing crops, the main goal of the painting is to convey the calm and serene life of the old and young generation. The old man looks at his grandson, who is intently and enthusiastically playing and imagines that after some time the same fate will befall the little boy. However, the grandfather is rather glad about this and being proud of his roots, or maybe he just remembered himself small and carefree. Thus, the life of a simple peasant, his problems, experiences and thoughts do not stand aside. Nesterov writes about them beautifully, warmly and harmoniously, in order to show the viewer the beauty of country life.